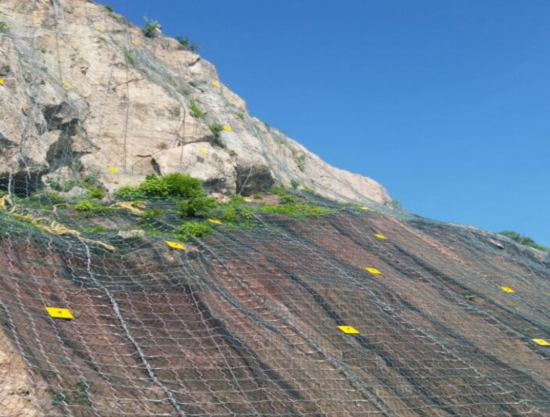 Maccaferri proposed and ultimately supplied a Rockmesh B300 solution for the stabilization of the slope located beside the Cuernavaca-Acapulco Highway. Rockmesh B300 is designed to protect against landslides and rockfall. The topic of rockfall is paramount as it is a phenomenon that is experienced world-wide. Maccaferri has over 60 years’ experience in rockfall protection systems and natural hazard mitigation and these historic interventions have also included embankments using our gabions, Terramesh Systems and Green Terramesh systems. These days, Maccaferri’s suite of rockfall mitigation solutions enables designers to select a product to specifically overcome their problem. A recent 2015-2016 project in Mexico demonstrates why it is important for engineers to devise lasting rockfall prevention measures. The constant and extraordinary rains of the previous year had caused the surface material to slide and the slope to become saturated, beside the Cuernavaca-Acapulco Highway. The superficial portion of the slope was reinforced by applying a high strength Rockmesh B 300 engineered from double twist steel wire hexagonal mesh and reinforced with 8 mm diameter steel cables interwoven with the mesh at 30 cm in both directions. mesh was secured to the slope face with friction anchors, installed in a rhomboidal pattern, to protect the road from a possible detachment of soil or rock. In the upper central part of the slope where large unstable blocks of rock were found, a solution was proposed using ground anchors up to 20m long.